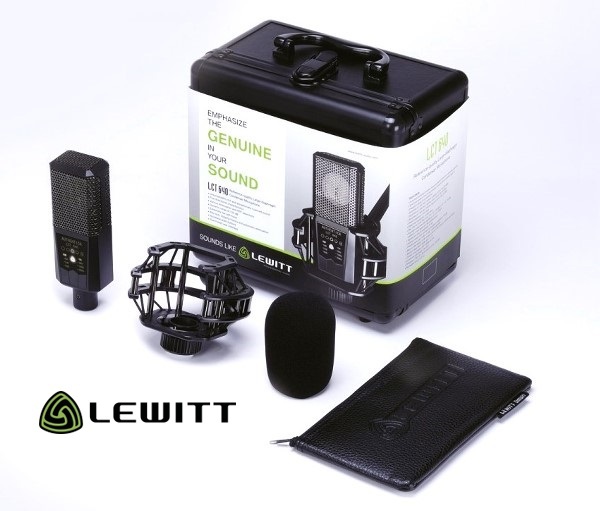 LEWITT’s LCT 640 is designed to raise the bar in its class of reference-quality large-diaphragm condenser microphones. This Austrian-designed and engineered pro-mic delivers a smooth, unsurpassably rich and exceptionally nuanced sound, and exhibits a remarkable set of qualities that enthuses even the most discerning users. The LCT 640 excels in a variety of demanding studio applications and stands for unrivaled performance in miking vocals, acoustic instruments, amplifiers, drums, grand pianos, wind instruments as well as classical music ensembles. LEWITT’s LCT 640 is designed to raise the bar in its class of reference-quality large-diaphragm condenser microphones. This Austrian-designed and engineered pro-mic delivers a smooth, unsurpassably rich and exceptionally nuanced sound, and exhibits a remarkable set of qualities that enthuses even the most discerning users. The LCT 640 excels in a variety of demanding studio applications and stands for unrivaled performance in miking vocals, acoustic instruments, amplifiers, drums, grand pianos, wind instruments as well as classical music ensembles. In addition to the standard omnidirectional, cardioid and figure-8 polar patterns, the LCT 640 offers a wide cardioid and supercardioid characteristic. It stands out for its huge dynamic range and extremely low self-noise. In combination with a 4-level low-cut filter and 4-level switchable pre-attenuation, the LCT 640 provides maximum versatility in all recording situations. Automatic attenuation, key-lock, clipping history, push buttons and an illuminated user interface round off the features of this outstanding microphone.